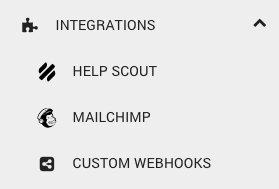 The MailChimp integration allows syncing user and/or customer emails directly with your MailChimp lists whenever certain events occur within your plugin or theme. Syncing the emails with your MailChimp is super easy! Click on Create New Rule. You can access the documenation of the events collection here. Select the MailChimp list you’d like to sync the emails to. If you prefer to sync the emails with any specific group, choose the group category and group. Finally, don’t forget to click save. MailChimp’s pricing is based on the number of subscribers in all lists combined. When the same email address is included in multiple lists, it counts as multiple subscribers. Therefore, whether you are selling a single plugin/theme, or have a shop with multiple products, in most cases, setting up a single list for all of your subscribers is good enough and a great way to save some money. Then, you can leverage MailChimp’s groups and categories to associate the subscribers with their respective prodct(s) and target your email marketing campaigns at the right people. Go to MailChimp and login. Create a list named My WordPress Shop (or any other name). Under the list management, go to Manage Contacts → Groups, and click Create Groups. Use your product’s name for the Group Category (e.g. My Awesome Plugin). Repeat steps 3-6 for every different product that you sell through Freemius. 1. Add email to My WordPress Shop/My Awesome Plugin/Active after install.installed or install.activated. 2. Add email to My WordPress Shop/My Awesome Plugin/Paying after payment.created. 3. Add email to My WordPress Shop/My Awesome Plugin/Customers after plan.lifetime.purchase, subscription.created, or license.extended. 4. Add email to My WordPress Shop/My Awesome Plugin/Trial Period after install.trial.started or install.trial.extended. 5. Add email to My WordPress Shop/My Awesome Plugin/Inactive after install.deactivated. 6. Add email to My WordPress Shop/My Awesome Plugin/Uninstalled after install.uninstalled. 7. Remove email from My WordPress Shop/My Awesome Plugin/Active after install.deactivated, install.uninstalled, or install.deleted. 8. Remove email from My WordPress Shop/My Awesome Plugin/Paying after license.expired or license.cancelled. 9. Remove email from My WordPress Shop/My Awesome Plugin/Trial Period after install.trial.cancelled or install.trial.expired. 10. Remove email from My WordPress Shop/My Awesome Plugin/Inactive after install.installed or install.activated. 11. 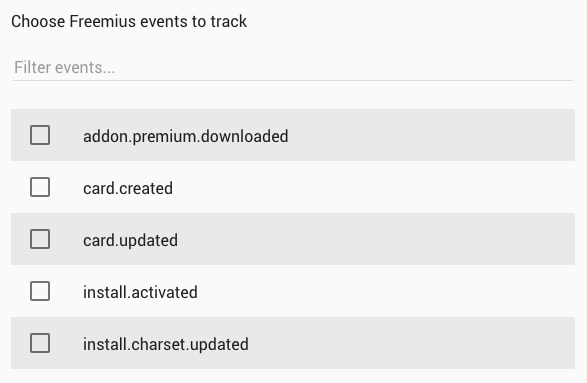 Remove email from My WordPress Shop/My Awesome Plugin/Uninstalled after install.installed or install.activated.